BUENOS AIRES, Argentina (AP) — President Cristina Fernandez is on a US tour this week with a message for critics on Wall Street and in Washington who say Argentina is headed for economic disaster by refusing to play by the rules of the global financial system: good riddance to the rules. Her government has racked up a long list of unpaid IOUs while helping the country recover from its humiliating, world-record debt default a decade ago, but Fernandez argues Argentina's economic rebound has been possible precisely because its leaders have stood up to foreign pressures and put their people first. Argentines used to be "dazzled by the North," she said last month while inaugurating an expanded highway, one of many infrastructure projects she said would have been impossible had her government done as outsiders demand. "They hadn't noticed that the rich countries don't want partners or friends; they just want employees and subordinates. And we're not going to be anybody's employees or subordinates. We are a free country, with dignity and national pride." Fernandez was meeting with billionaire George Soros and Egypt's new president Mohamed Morsi on Monday, but was skipping a dinner that President Barack Obama is hosting for his fellow leaders at the Waldorf Hotel, planning instead to visit an Evita Peron exhibit at the Argentine consulate. As Fernandez addresses the United Nations Tuesday and then takes questions at Georgetown and Harvard later in the week, she's sure to insist, as she has often in the past, that her forceful management of the economy has made factories rebound, jobs more secure, society more egalitarian and the future brighter than it has been in years. Fernandez says corporations no longer tell Argentine presidents what to do, and instead must heel to a government that puts the people's needs first. Natural resources are once again sovereign, and Argentina is freer than ever from international debt obligations. A far different picture is presented by Argentina's many critics in the U.S. and Europe. In the past few days alone, Moody's Investors Service downgraded the country's risk rating, potentially increasing borrowing costs for anyone doing business with Argentina, and the International Monetary Fund chief drew a firm line Monday against Argentina's widely disbelieved economic data. The government's INDEC statistics agency has magically kept inflation below 1 percent monthly for the last 29 months, even as consumers struggle with price hikes two or three times bigger. "This is the last yellow card we show them," Christine Lagarde said Monday, giving Argentina until Dec. 17 to publish accurate inflation and growth numbers, or face unspecified sanctions. "I hope we can avoid the red card, but if the statistics aren't corrected, if they don't comply with the rules, then all the players are equal. It doesn't matter how well they play football." Obama's trade negotiators and diplomats have lost patience, removing trade preferences over her refusal to pay more than 100 court judgments to U.S. businesses. 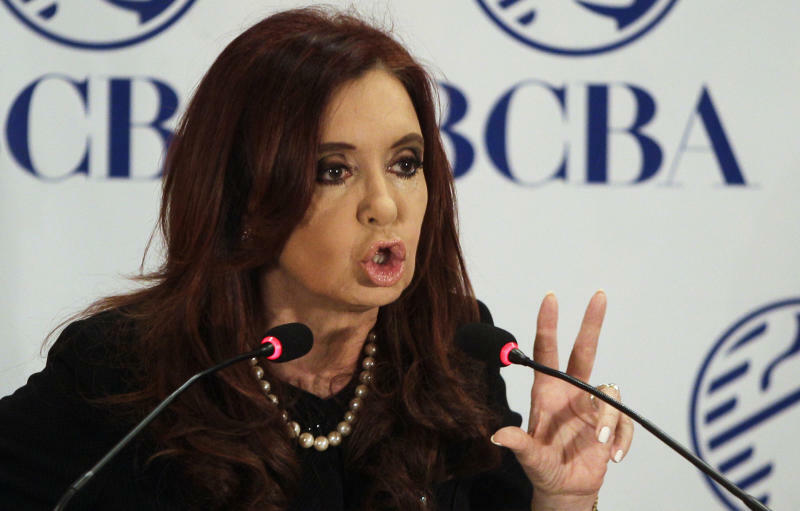 Her government also has ignored World Bank arbitrators, stiffed the Paris Club lenders and brushed off the European Union's threats of sanctions for expropriating Grupo Repsol's $10.5 billion stake in Argentina's oil company without any compensation. "These legal questions continue to raise red flags to investors that the Argentine government does not respect the rule of law," University of Houston energy analyst Michael Economides concluded Thursday in a scathing report that accused Fernandez of "populist thuggery." Argentina appears to have reached "a tipping point in a downward economic spiral," he warned, advising the government to quickly "show investors it is willing to play by the rules" and then finance the exploitation of its vast oil and gas reserves by taking on more foreign debt. Fernandez anticipated such criticism in her highway speech, recalling that her late husband and predecessor, President Nestor Kirchner, "dared to tell the IMF to go to hell." "That's what they're never going to forgive: that Argentines have been able to demonstrate, contrary to all the theories of despondency, of fear, of unpatriotic feelings of those who didn't believe in Argentina . that they could do what's necessary so that Argentines would live better," she said. "They still keep punishing us, because we're a bad example; we're the example that it's possible to build a country without an outside tutor. We're the example that a country can vote for a president and the one who decides is this president." Most Argentines are without a doubt living better than they were a decade ago, when the economy was in ruins, but years of rapid growth have lurched to a halt this year. Even the INDEC on Friday reported zero GDP growth in the second quarter, and a 15 percent plunge in domestic investment. Private analysts have presented still more grim numbers, and accused Fernandez of pushing Argentina into a recession. Support for her government's performance has plummeted, from 64 percent last October to 35 percent last month according to Management & Fit. The Buenos Aires consulting firm's survey of 2,259 people had an error margin of 2.2 percentage points. Then again, analysts have been predicting Argentina's imminent collapse for years, and Fernandez shows no signs of reversing course. Her attitude could be tested during a meeting Thursday with Exxon Mobil Corp. CEO Rex W. Tillerson to discuss new joint ventures. Economides is one of many energy analysts who say that absent full compensation for Repsol, no other major company will commit the billions of dollars over many years that will be necessary to fully exploit Argentina's massive shale oil and gas reserves. Fernandez has had ever-fewer checks on her power since she was re-elected by a 54-percent landslide last October. Her allies firmly control congress, keep the courts in check and have silenced government auditors who might otherwise challenge her administration. Inconvenient data can be ignored or buried: National crime figures haven't been released since 2008. Since Kirchner's death nearly two years ago, Fernandez, 59, has made so many major decisions within a small circle of advisers that Argentines joke about living in a "dedocracy," after "dedo," Spanish for finger. They say nothing happens without her touch. A $6 billion welfare program she created by decree has since more than doubled in cost and scope without so much as a congressional hearing. The private pension funds she nationalized brought in vast pools of money that she has spent at her discretion. She recently redirected treasury and pension funds to housing loans for the poorest Argentines at rates so low that the principal will be seriously eroded by inflation. Fernandez has been popular in part because all this spending has kept the economy moving. Rounds of salary increases of 25 percent or more have enabled the working poor to keep up with inflation, and child welfare payments have kept the slums from exploding. 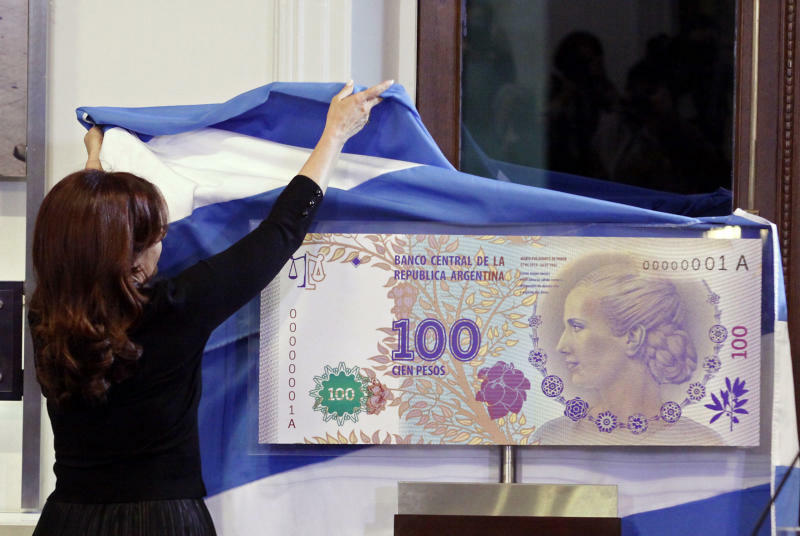 But middle-class and elite Argentines who see their wealth under attack have been increasingly gloomy now that her government has made it impossible to legally trade pesos for dollars. The measures are aimed at cracking down on tax-evasion and maintaining the country's cash reserves, but they have also spooked investors and failed to stem capital flight, which INDEC said totaled $1.2 billion in the last quarter alone.